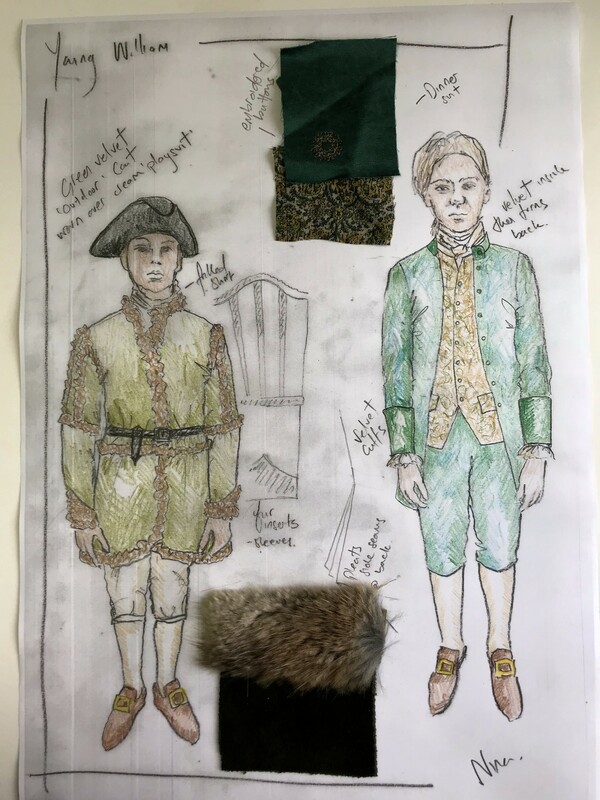 I wanted William to look as much ‘The Little Lord’ as possible and therefore used the finest materials to create his costumes. The cream linen ‘playsuit’ which he wears was designed to link to Jamie’s black linen suit, although purposely ‘impractical’ with the color choice. His silk ‘dinner suit’ is reminiscent of Lord John Grey’s suits, with the contrasting turn back collar. I wanted to show links to both fathers. The fur lined velvet hunting coat was designed to show his wealth but also to help deal with the practicalities of shooting in Scotland in the middle of winter.